Being a video editing artist, I have to encounter that editing software usually post error and computer runs slowly, and I have to reinstall system. 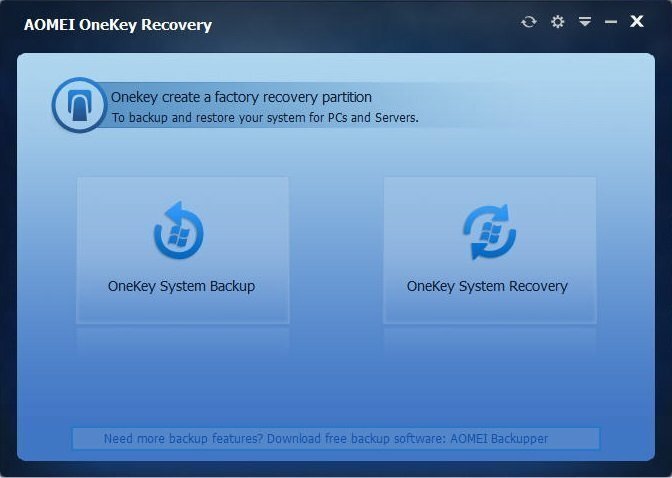 AOMEI OneKey Recovery help me to deploy system recovery drive, which backup my system and recover it easily. The importance of system recovery drive was understood by me in last week. Being an artist of video editing and effect, computer is very important tool in the work. But with large software used in computer, the running speed of computer was slower and slower. When I asked my friend how should I do? He told me that I have to reinstall system. Yes! You heard right. He was a sophisticated effect artist, and he told me he have reinstall system for many times. I complained that the cost of reinstalling system is too high, and all application will be gone. His answer is deploy system recovery drive. Why should I deploy system recovery drive? “why should I deploy system drive?” I asked him this question. Now I have a general understanding after he explained too much patiently. All applications must be running based on operating system, which has the limitation of master boot. With the same theory, all applications have some requirements to operating system. Not all applications can run or run fluently under operating system, for example, when Microsoft word/excel/power point have low demands to system operating so they can run in all computer, but being one of video edition applications, such as adobe premiere, Edius, Final cut, they are so professional that have higher requirements to computer hardware configuration and operating system. These video editing software will put a great pressure on CPU while they run, especially render. If you can’t change hardware configuration, the better way is to reinstall operating system. For all common users like me, it is impossible to send computer to repairing shop usually just for reinstalling system . If there are a way that we can reinstall computer system by myself, I will consider to try. Yes! The answer I got is positive, deploying system recovery drive is the best way for solving such problem. What is system recovery drive. System recovery drive is also called recovery partition. Actually, it is to backup your system partition. The difference from common system backup is that system recovery drive can be restored by pressing certain key, but common system backup is just to copy file and data in system partition to external or internal hard disk. If computer crash, common system backup can’t be used, But system recovery drive will be good way to restore system. Deploying a system recovery drive is to make a system image to store some certain place, such as USB, DVD/CD, or computer partition. And if you want to restore your system to back the timepoint you just backed up, you only need to active system recovery drive. When you buy new computer, actually, it will preinstall some recovery software, even when you start your computer for the first time, it can be make a system recovery drive. unfortunately, seldom of user know how to use it. Because some preinstalled complications in computer have some requirements. Set me as an example, I want to recover my computer with the backup image, which is stored bin the invisible partition and is also called system recovery drive. when I startup the Toshiba recovery wizard in my Toshiba computer, it requires me to insert a blank DVD/CD into computer. I was confused! There is system backup image, why does it require me to do that? Anyway, summarize ways form citizens, and there are some ways to deploy system recovery drive. Using built-in function in computer. If you use computer installing Win 8, you use built-in function in win 8. You can select “Create a recovery drive” in setting, and plug in USB falsh drive or DVD/CD into computer. Download and install quickly, and its storage volume must be little. My computer have many huge applications, and I don’t really want to download a software with 100 MB and spend more than ten mins to install it. Easy to operate and fast to solve my problem. I don’t really want to spend much time to learn some unpractical skill, what’s worse, it won’t solve my problem. Cheap software, it is better if it can be free charge. Everyone like free foods, me included. If it can’t be free, at least it should be cheap. When I evaluate all software and ways I mentioned with standards above, AOMEI OneKey Recovery is not doubt a software I select to deploy system recovery drive. system recovery drive will be made automatically after clicking the button ”backup”, and the system recovery drive will be invisible for safe. If I want to recover it, just launch this software and click “recovery” button. See! That's easier than other software that requires DVD/CD.